HAUNTED HOTEL BALL CHECKS IN TO LAS VEGAS’ MANDALAY BAY THIS HALLOWEEN! 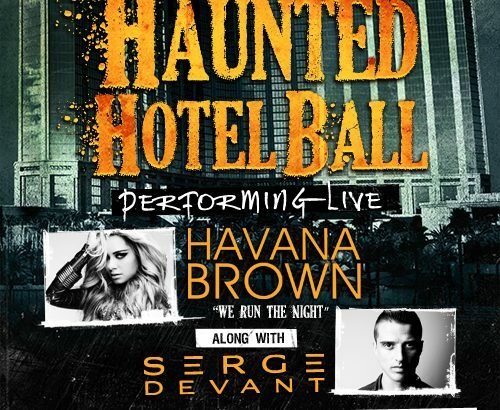 CHICAGO, IL (September 13, 2012) – Chicago and Phoenix/Scottsdale’s biggest Halloween costume party, Haunted Hotel Ball, checks in to the Las Vegas Strip’s Mandalay Bay on Saturday, October 27, 2012 with a live performance from Havana Brown of her 2012 Billboard #1 hit single and a $5,000 costume contest. Created in 2008 by nightlife producers Global Adrenaline, Haunted Hotel Ball attracts over 4,000 partygoers and sells out Hilton Chicago and Hotel Valley Ho in Scottsdale each year. Now, the all-night Halloween bash has its sights set on Sin City, where partying till dawn is mandatory, making it the perfect next stop for the event that is becoming the top Halloween party brand in the US. Haunted Hotel Ball combines elements of a VIP nightclub experience, with the exclusiveness of a hotel gala, and the terror of a haunted house. The moment you enter Mandalay Bay, you will be directed to a 30,000 square foot ballroom transformed by an Award winning design team into an eerie setting from Las Vegas past with theatrical encounters from wolf man Elvis, vampire showgirls, Mummy Contortionists and aerial ghosts. Global Adrenaline has assembled a dynamic team led by Tony Duffy of Lightning Man Productions, a nationally recognized event producer with Halloween “specialization” as the executive. Along with Tony, Allen Stevens of Quantum Boxx Visual Engineering will lead as Tech Director with support from the team at AV Las Vegas, The concert and toured event industries “go to” for audio, lighting, video and all things in between in L.V. This sensory assault will freeze you in terror with a full scale gothic castle set provided by A Way of Life Productions, Chad Craig a pioneer of themed nightlife events in L.V. The Set will be further entombed with creepy décor elements from veteran, décor specialist Ian Campo of A Designers Secret Weapon. With this stage set, the HHB cast of the undead will come to life with direction, make-up and costuming from Kristen Yardley, a technician for MYSTERE by Cirque du Soleil and Principal at Pound of Flesh FX. Over 3,000 costumed partygoers will dance to the dark and dirty beats of world renowned DJs and recording artists, including a live performance from the Australian export Havana Brown, whose track “We Run the Night” featuring Pitbull, reached #1 on the US Hot Dance Club Songs chart and peaked at #26 on the Billboard Hot 100 this year. Outrageous, bizarre and risqué will be among the Halloween costumes competing in the $5,000 cash and prize virtual costume contest. Photos of the top contestants will be posted on the Haunted Hotel Ball website following the event and visitors will vote for their favorite costumes from the three Haunted Hotel Ball locations.